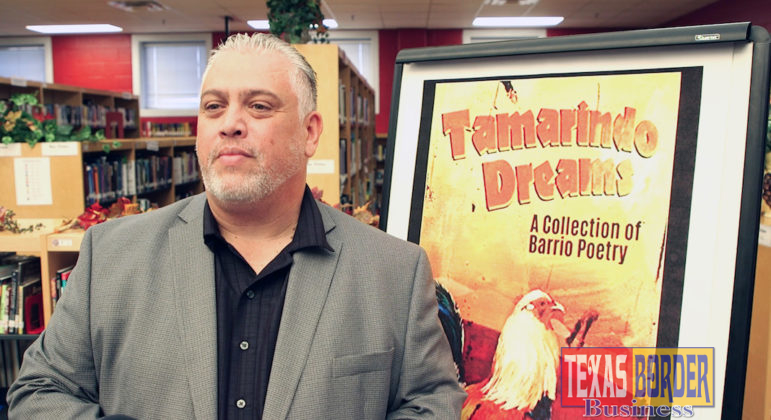 Author Roberto Rocha stands in front of a poster of his book “Tamarindo Dreams: A Collection of Barrio Poetry,” while visiting with students at Edinburg High School. 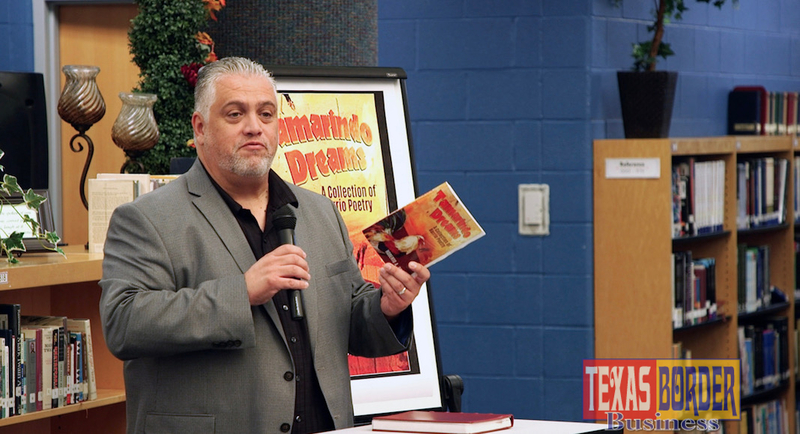 Author Roberto Rocha holds his book “Tamarindo Dreams: A Collection of Barrio Poetry,” while visiting with students at Edinburg High School. 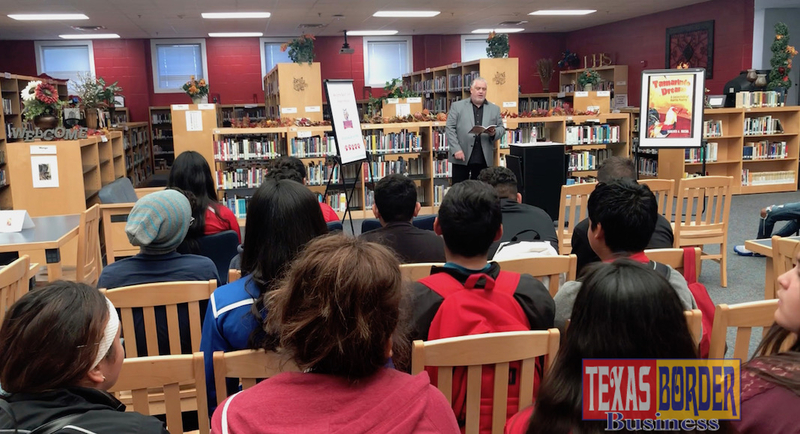 Author Roberto Rocha discusses his book “Tamarindo Dreams: A Collection of Barrio Poetry” with students at Edinburg High School. 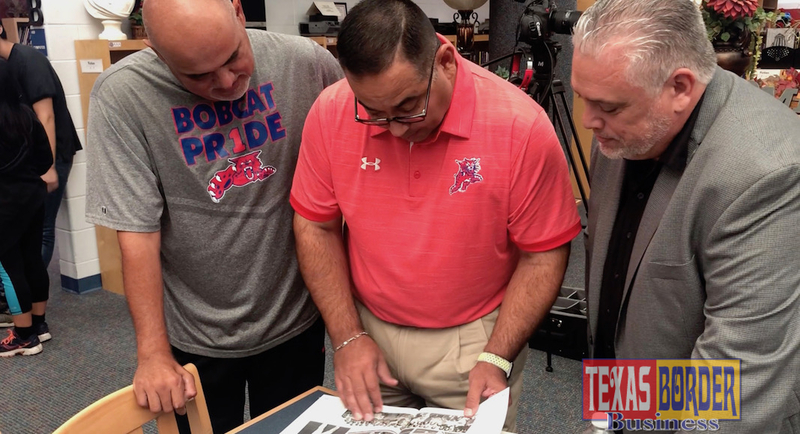 Author Roberto Rocha (right) looks through his 1986 Edinburg High School yearbook with former classmates ECISD School Board President Robert Pena Jr. (center) and Edinburg High School Head Football Coach J.J. Leija (left). Author Roberto Rocha (center) holds his book “Tamarindo Dreams: A Collection of Barrio Poetry,” while posing for a photo with students, staff and classmates at Edinburg High School. EDINBURG – Edinburg High School graduate Roberto Rocha recently visited his old high school to talk about his latest book “Tamarindo Dreams: A Collection of Barrio Poetry.” The book is a collection of 30 Tex-Mex poems he wrote while growing up in the Rio Grande Valley. The Edinburg High School Library Department invited him to talk about his latest book and to help inspire some of the students from the Edinburg Consolidated Independent School District. In the book, Rocha’s poems peer into his life and highlight some of the joys and hardships he has encountered with friends and especially his family. “Mija, I remember the little yellow dress that I bought for you at K-Mart. It was all of the money I had in my wallet and in the world. Seven dollars or something like that. You looked bien mona, preciosa, bonita. A true princess you were, have been and remain.” Rocha recited from his book. The poem “Mija” is about his daughter Cathy. He said the poem is a way of letting her know how special she is to him. “I just wanted her to know that should anything happen to me and we don’t get a chance to speak before then, I see you as my princess always,” he said. However, one of the first times that Rocha’s photo appeared in a book goes back to 1986 in his yearbook, when he graduated from Edinburg High School. “Oh my, let’s see. I haven’t seen this book in ages. 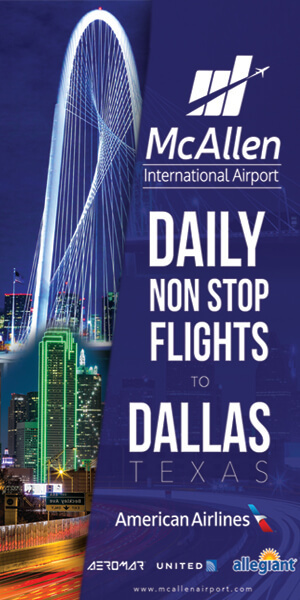 Oh yeah, look at that. There I am,” said Rocha, laughing and pointing to his yearbook photo. 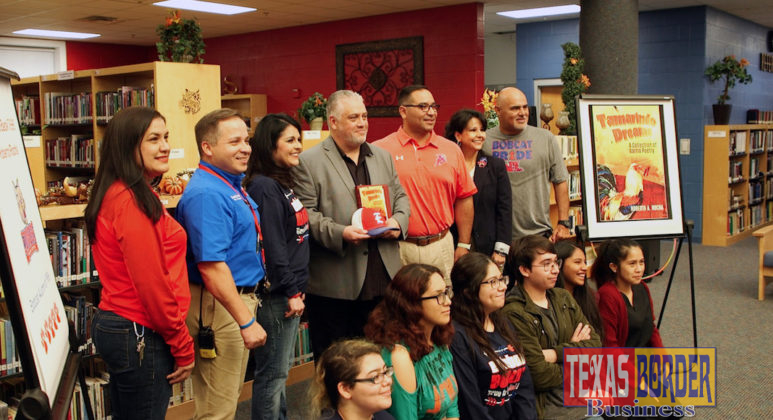 While on his book tour at Edinburg High School, Rocha met up with some of the people he graduated with like Robert Pena Jr., who is the current president for the Edinburg CISD Board of Trustees. Many of the students said that they felt inspired by Rocha’s book of poems. “I have never heard of him and I’ve never read his book. 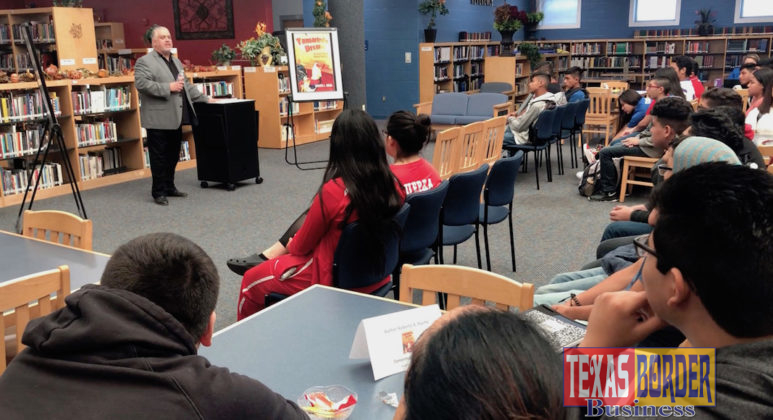 But based on the speech that he gave, I’m wanting to read it to see what’s it like and maybe it might teach me a few things about life,” said Adriana Mendez, a 10th grader at Edinburg High School. Looking back on his own life, what advice would Rocha give himself now? Rocha said that he tells all students that there’s plenty of time to get a good education to better themselves and their families. And, he said that when time allows write it down for all the world to see. “I read a quote that really inspired me that said, ‘Write the book that you want to read because sometimes we can’t find what touches our heart and our soul.’ So, if it’s not out there that means that you need to create it,” Rocha said.